A few days ago, I realized that I screwed up where I cut the pockets for the drift pins. 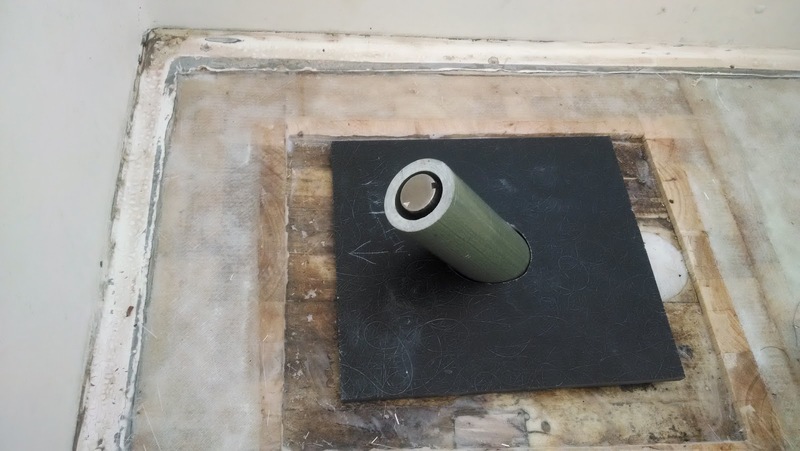 When I measured the distance to cut the pockets from the leading edge of the rudder, I didn't take into account the width of the shaft so as a result, all but one of the pins extend into the pockets only about 1/2 inch. 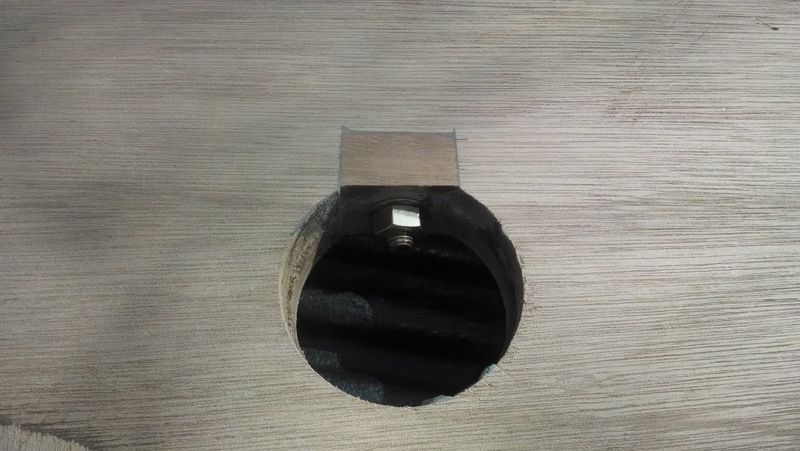 Technically enough, but I wanted the washers and nuts to sit on a nice flat piece of wood so I planned to glass in some hardwood pieces and the 1/2 inch just wasn't enough room. I was planning originally to use some leftover sapelle holesaw cut outs from my grabrail project, but because the drift pins only extended about a half inch into the pocket, there wasn't enough room except for 1 of the holes (I don't know how I cut that one correctly and all the others were off). So I basically made a dutchman patch at the bottom of each pocket and epoxied sapelle blocks in for the plywood I cut out. All in all it achieved what I had intended, but it took more time than I had originally planned and I'm still kicking myself for not paying more attention to my measurements. Insert stainless shaft up and into boat. This is where a third person would be good to have to just hold it in place while the other steps are done. 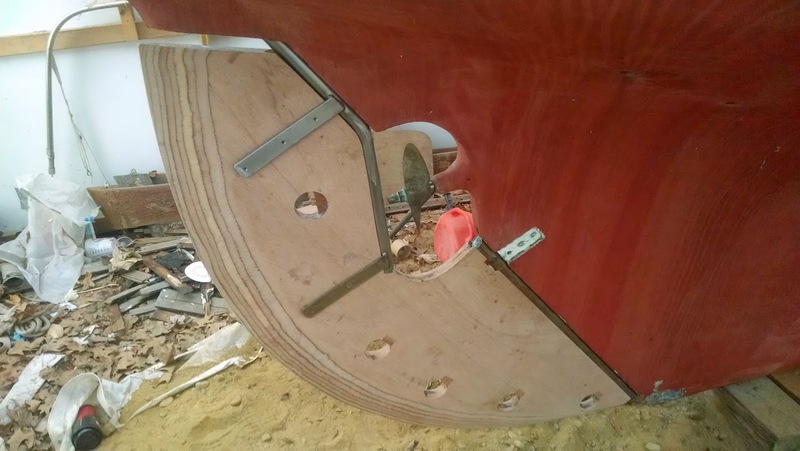 Take rudder and lower shaft and insert into bronze shoe pin at base of keel. Wiggle rudder in between welded straps on top of shaft. Insert upper drift bolt and tighten nut. The final fitting will include bolting straps through the rudder and bolting lower strap around bronze shaft, but I have a lot of epoxying to do in the meantime. Anyway, I'm happy to report that my measurements are just about spot on and I think things are all going to work out very well. One of the only things that were off was that one of the welded straps on the shaft binds up when the rudder is turned to a great degree. I will have to grind out a small area on the keel side of the rudder to accommodate, but can be done easily in about 10 minutes with a rasp. I'll also have to trim down the rudder tube extending into the cockpit to make room for the tiller head, but I had actually planned to keep the rudder tube a bit on the long side until I figured out the final dimensions of the new shaft. Next up, I'll be applying a coat of CPES to the entire rudder before I do the actual glassing. It may be overkill, but I've heard it makes a good substrate for epoxy to adhere to and ultimately, there is no way I'll keep the water out forever, so this should provide a last line of defense against water intrusion.